6Firat University, School of Medicine, Department of Biochemistry, Elazig, Turkey DOI : 10.5137/1019-5149.JTN.22022-17.2 AIM: To investigate the possible role of ELABELA (ELA) in the histopathological grading of gliomas. 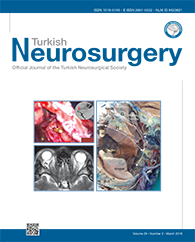 MATERIAL and METHODS: We retrospectively assessed pathological specimens of patients who underwent surgery for intracranial space-occupying lesions. Only primary glioma specimens were included in this study. We enrolled 11 patients histologically diagnosed with low-grade glioma and 22 patients with high-grade glioma. The ELA antibody was applied to 4?6-?m-thick sections obtained from paraffin blocks. Histoscores were calculated using the distribution and intensity of staining immunoreactivity. An independent sample t-test was used for two-point inter-group assessments, whereas one-way analysis of variance was used for the other assessments. p<0.05 was considered statistically significant. RESULTS: The histoscores of the control brain, low-grade glioma, and high-grade glioma tissues were found to be 0.08, 0.37, and 0.92, respectively. The difference in ELA immunoreactivity between the control brain tissue and glioma tissue was statistically significant (p<0.05). In addition, a statistically significant increase was observed in ELA immunoreactivity in high-grade glioma tissues compared with that in low-grade glioma tissues (p<0.05).